The U.S. has made it clear that the Iran nuclear deal will have no impact on Washington’s plans to set up a missile defense system in Europe, to which Moscow is strongly opposed, justifying them by citing Iran’s efforts to develop ballistic missiles. Russian experts, while admitting that from the formal point of view Washington’s arguments are justified, point out that the alleged threat posed by Iran is an illusory one. Russian Foreign Minister Sergei Lavrov has reacted with surprise to statements from the White House that the U.S. does not intend to curtail plans to establish anti-ballistic missile (ABM) defense systems in Europe following the historic deal agreed with Iran over Tehran’s nuclear program, despite earlier comments made by U.S. President Barack Obama. The United States began testing its National Missile Defense system in 1999, under President Bill Clinton. Two year later, President George Bush Jr. announced that the system would protect not only U.S. territory but also the territory of America’s allies. In 2002, Washington unilaterally withdrew from the Anti-Ballistic Missile (ABM) Treaty signed by the U.S. and the USSR in 1972, which envisaged considerable restrictions on deploying missile defense systems. 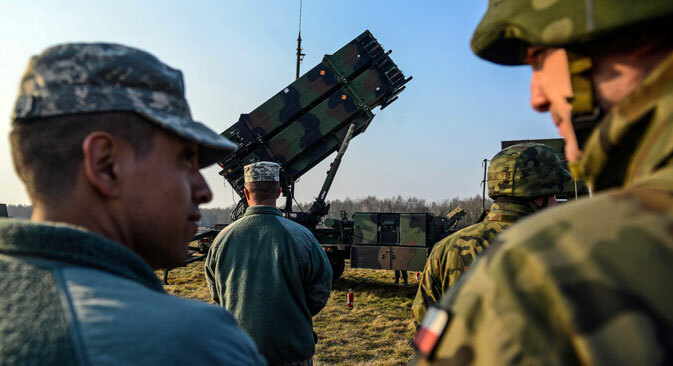 As part of creating the European segment of U.S. missile defense, bases are to be set up in Romania and Poland. Construction of the Romanian base, which will house interceptor missiles and radar stations, began in 2013. Construction of the ABM base in Poland will start in 2016 and is due to be completed two years later. According to official U.S. statements, the defense system in Europe should protect the United States and its allies against a possible strike by countries like Iran or North Korea. However, the Russian authorities insist that the the U.S. missile defense system in Europe presents a threat to Russia’s nuclear deterrent potential. After the P5+1 group of international mediators (the U.S., Russia, China, the UK, and France, plus Germany) and Iran finally reached a deal on July 14, Lavrov recalled that the U.S. president had promised to give up plans to construct a missile defense system in Europe if an agreement with Iran was reached. Washington points out that Iran possesses the biggest stockpile of ballistic missiles in the Middle East, adding that the agreement reached on July 14 envisages that the existing UN sanctions regarding Iran’s ballistic missile program will remain in force for eight more years. Russian envoy to NATO Alexander Grushko, meanwhile, said he was surprised at “how easily Washington was renouncing its earlier approaches.” According to Russian analysts, the U.S. statements show that its interceptor missiles in Europe are targeted not against Iran but against other countries, primarily Russia. Viktor Murakhovsky, a Russian military expert and editor-in-chief of the Arsenal of the Fatherland magazine, told RBTH that it was hard not to see a substantial degree of deceit behind the attempts to separate the issues of the Iranian nuclear program and Tehran’s efforts to develop ballistic missiles. Because on the one hand, indeed, the agreement concerns the nuclear program and not Iran’s ballistic missiles, but on the other, the nuclear program presents a threat when coupled with the capability to deliver warheads. “They [the Americans], of course, primarily link the ballistic missile program with the presence of nuclear weapons. Because it is pointless to build such expensive facilities against missiles carrying conventional weapons,” said Murakhovsky. Statements about the threat presented by Iran's missile program do not appear to be quite justified either. According to Murakhovsky, although Tehran is trying to develop its ballistic missile program, it has not achieved any significant successes and does not have many prospects either. Iran's biggest achievement in this field so far is the development, on the basis of technology obtained from North Korea, of a missile based on the Soviet R-17 model with a maximum range of 2,000 km (1,250 miles). For the missile defense facilities that the U.S. is setting up in Europe to be potentially used to counter an Iranian threat, Tehran would have to at least double the range of its missiles. There is nowhere that Iran could obtain the necessary technology for this, said Murakhovsky: North Korea does not have it, while Russia, just like the U.S., complies with agreements that prevent the proliferation of these technologies. Deputy head of the Institute of Political and Military Analysis Alexander Khramchikhin agrees that, from the formal point of view, Washington’s arguments are correct. "From a purely formal point of view, indeed, this [agreement with Iran] does not concern ballistic missiles," he told RBTH. At the same time, he does not see any real threat that Iran could present to the U.S. According to Khramchikhin, currently Iranian missiles do not have the capability to reach Europe. "Theoretically, it may become possible in future, but what for?” he asked, adding that it is hard to see any reasons that would prompt Tehran, assuming it had the necessary capability, to carry out a missile strike against Europe. Overall, the expert continued, the Iranian threat is a far-fetched one.